Ah, take us back to Laos! 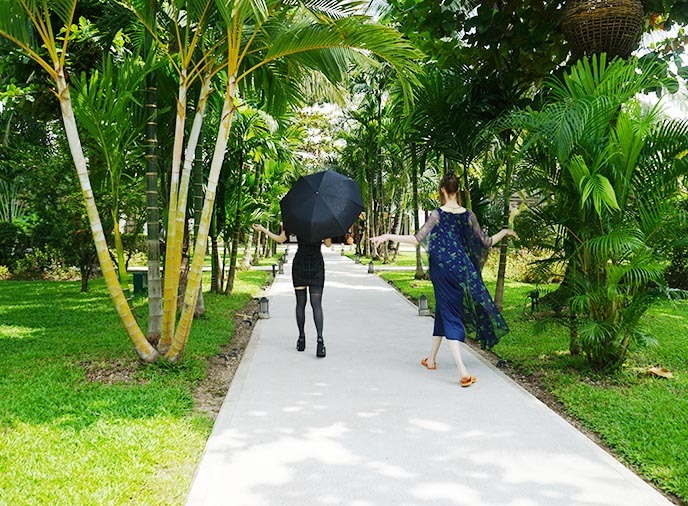 The laid-back, Buddhist country stole a piece of our hearts when my friends and I visited in September. 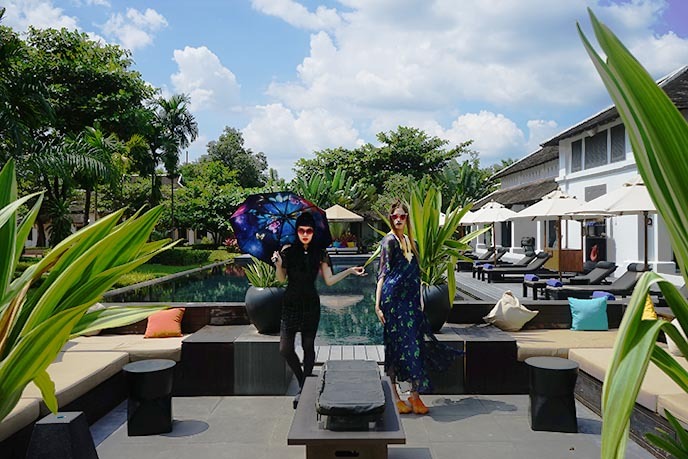 Staying at Sofitel Luang Prabang hotel made our trip particularly memorable. 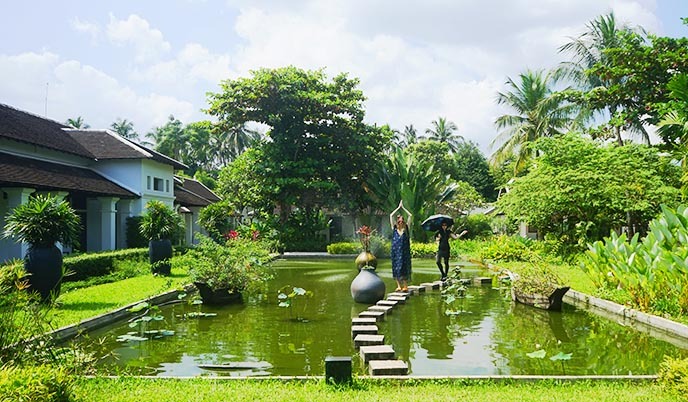 As you can see from the images, this property is a Southeast Asian tropical daydream. 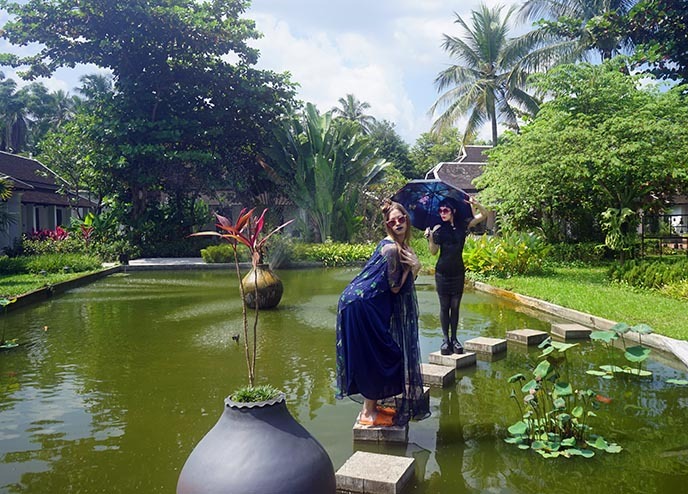 In this final story from Luang Prabang, we’ll take you through Sofitel’s lush gardens — as well as sister property 3 Nagas by MGallery. Fair warning: you might feel hungry when you see the river-fresh Laotian food we ate. But first, since it’s Black Friday (Nov 23), I thought I’d share some finds that caught my eye. 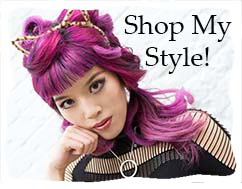 I Am Gia has Goth grunge punk clothes that are currently on sale for Cyber Monday. (1) Their amazing one-sleeve bodysuit is apocalypse sci-fi ready. (2) Love the plaid tartan and silver chain of Gia’s skirt. (3) And how great is this leopard print coat: reminds me of the one Shirley Manson of the band Garbage wore in the 90s! 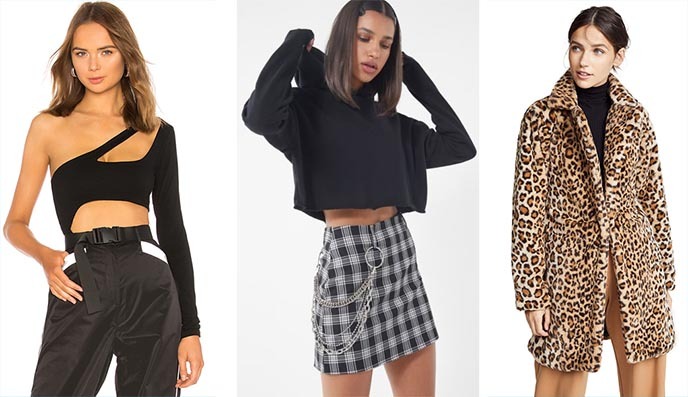 It’s almost the Nightmare Before Christmas, and these Goth clothes are on sale right now as well. 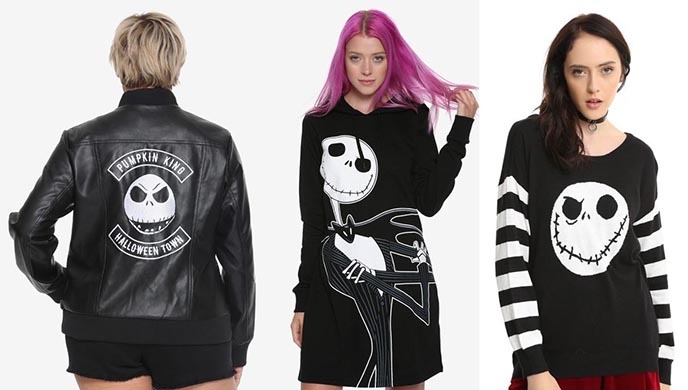 Love this Jack Skellington bomber jacket, this Gothic Xmas long sleeved dress, and epic skull sweater. I’m also offering Black Friday reductions on my closet sale! 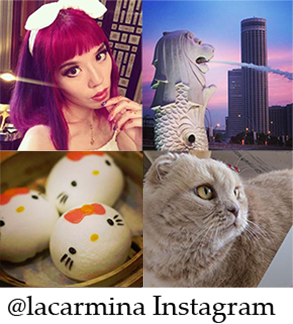 Just listed new items from my wardrobe, and happy to do bundles and discounts. 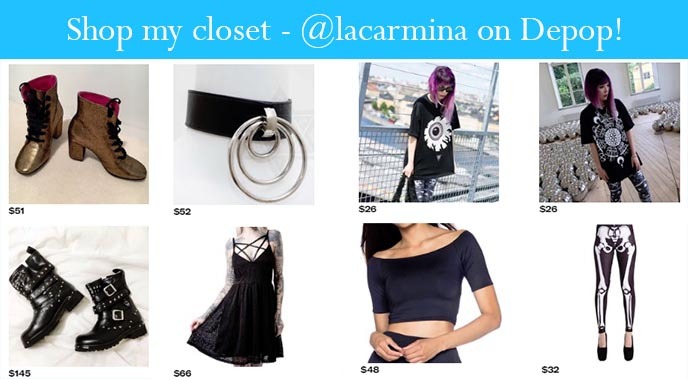 You can shop my Depop @lacarmina (or Google “La Carmina Depop” to find my shop). If you prefer, you can contact me by email (gothiccarmina attt gmail dott com) to do a sale, instead of using the app. 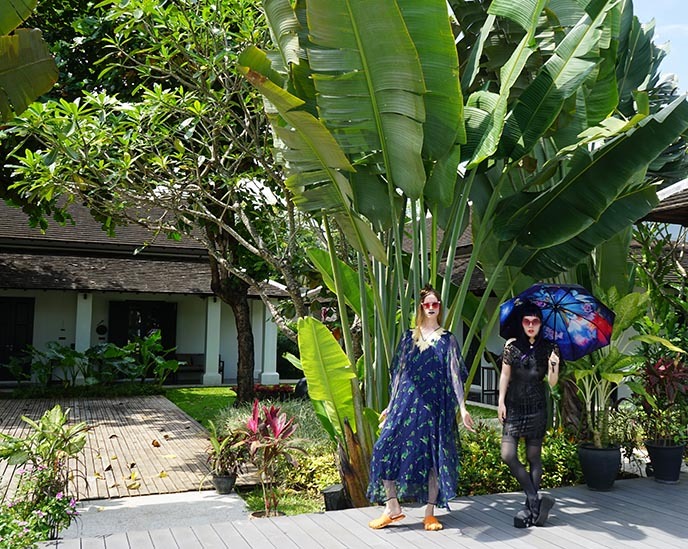 Yukiro and I wore dresses with decadent accents to match the stately French design of Sofitel Luang Prabang. 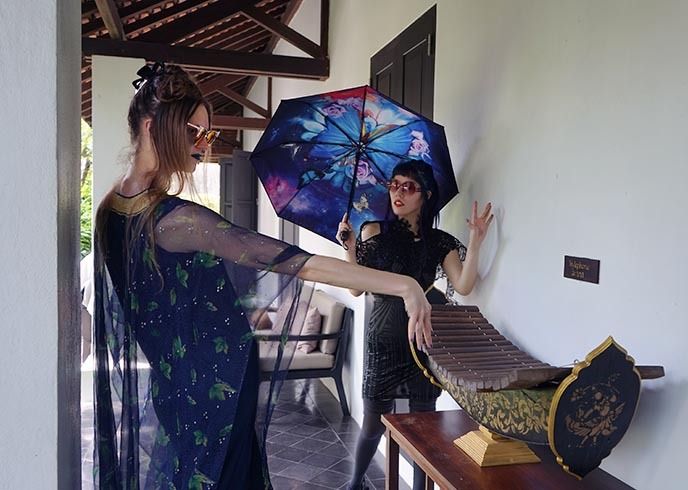 OOTD: My dress is Cyberdog, and I’m holding a UV-protecting parasol by Boy1904 Umbrellas. 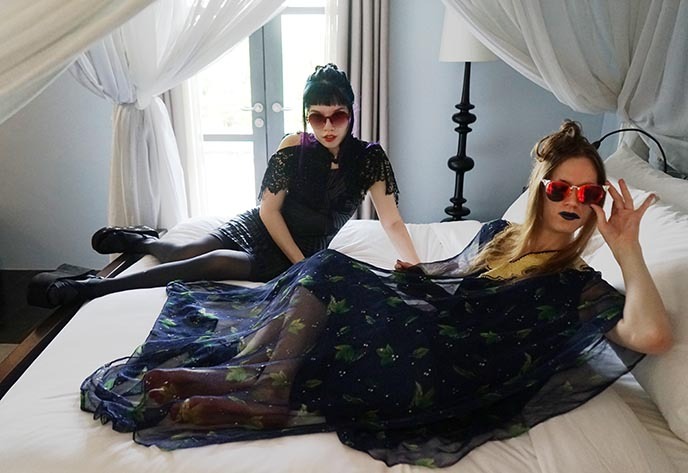 My shoes are these platform sandals by Rocket Dog, and my black lace capelet is Pheren Couture. 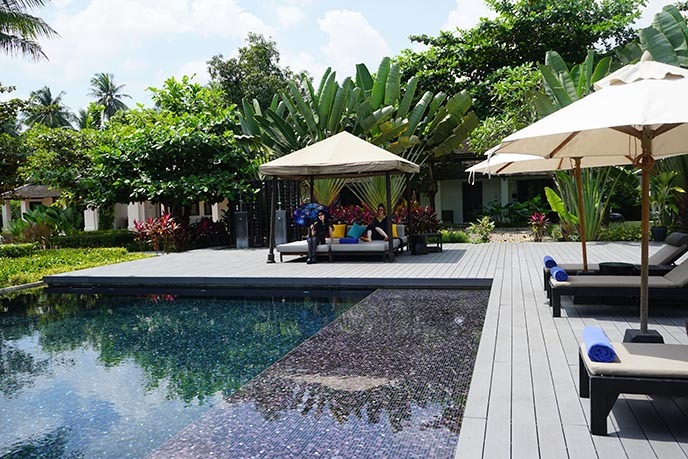 The Sofitel is located in Ban Mano, a peaceful residential quarter of Luang Prabang. 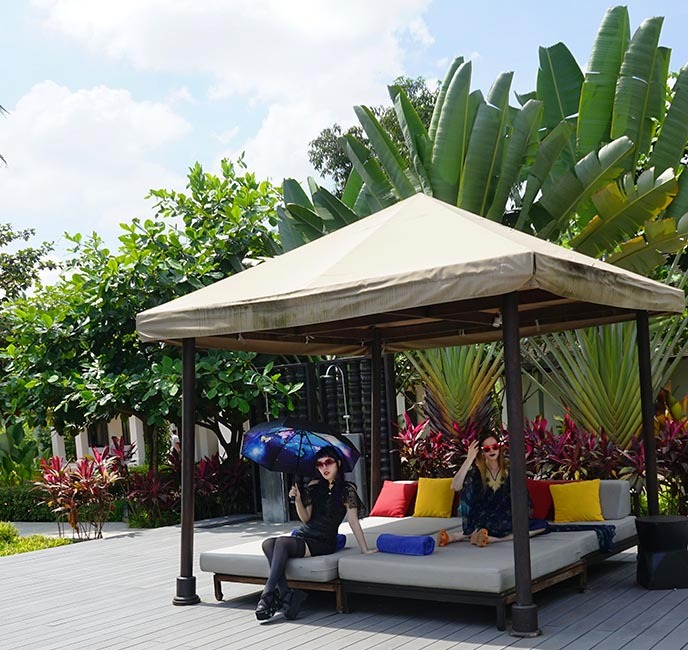 The grounds are a fusion of Laotian materials with colonial-meets-contemporary French design. How inviting are these colorful pillows and lounge seats by the swimming pool? The inner courtyard features a lush pond with floating lilies, framed by palm trees and tropical flowers. We dared to do acrobatics on the stepping stones across. Sofitel Luang Prabang has rooms fit for royal queens. The suites feature five-metre-high ceilings, and open up to a private garden / patio, or personal swimming pool. These modern rooms have an old-world nostalgia: traditional art on the walls, and a four column carved poster-bed shaded by mosquito netting. The clay-roofed villas are outfitted with every luxury — yet you feel as if you’re nestled in the quiet countryside of Laos. Luang Prabang is frequently described as a “sleepy” city, giving travellers a chance to slow down and focus on wellness. 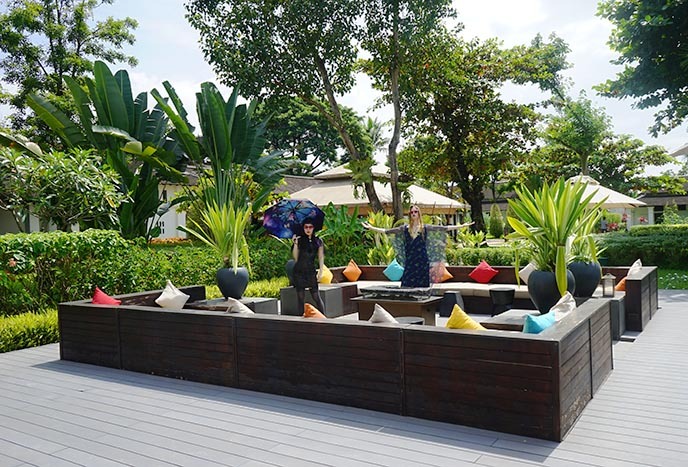 At Sofitel’s Le Spa, we indulged in ancient Laotian massages, where the ladies climbed up and used their elbows to work out all our kinks. The hotel also offers free essential oil baths, delivered right to your room. 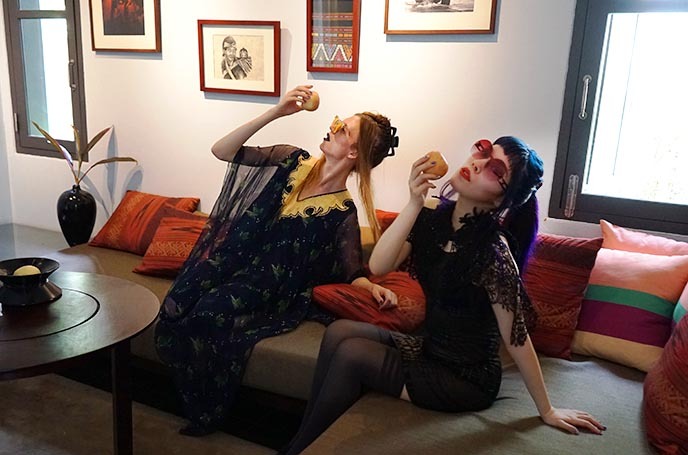 Now this is how to enjoy life: lounge around, eat apples, and brew lemongrass and roselle tea! Love how the Sofitel incorporates regional hand-woven textiles, pillows, pottery and antiques in each room. Every morning, we feasted on the breakfast spread overlooking the pool and gardens. 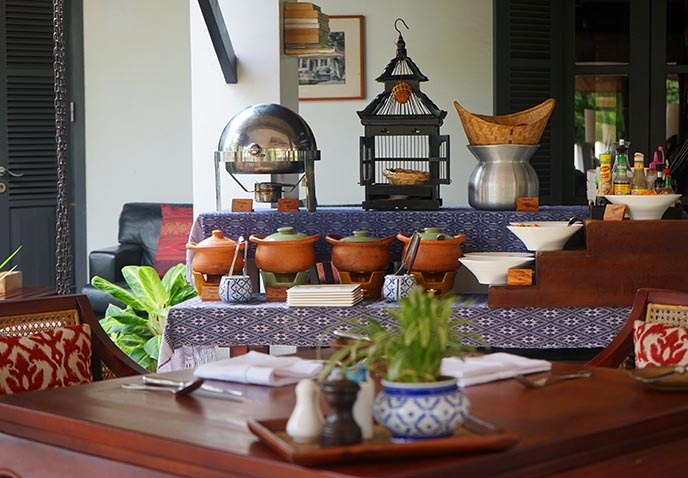 The pots hold sticky rice, stewed fish, vegetable noodles, and other local specialties. 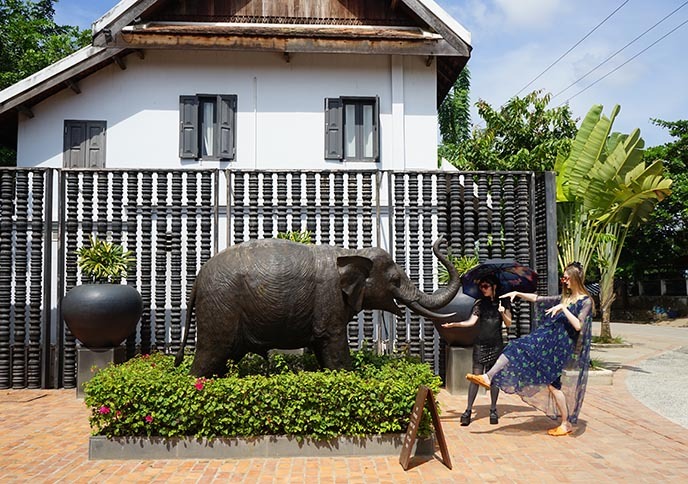 The hotel honors Laotian culture through art displays and events. Guests can also take part in the morning alms ceremony, where locals offer food to a procession of saffron-robed Buddhist monks. It’s hot and humid in Laos… this 25-metre mosaic-tiled pool is calling us in for a dip. 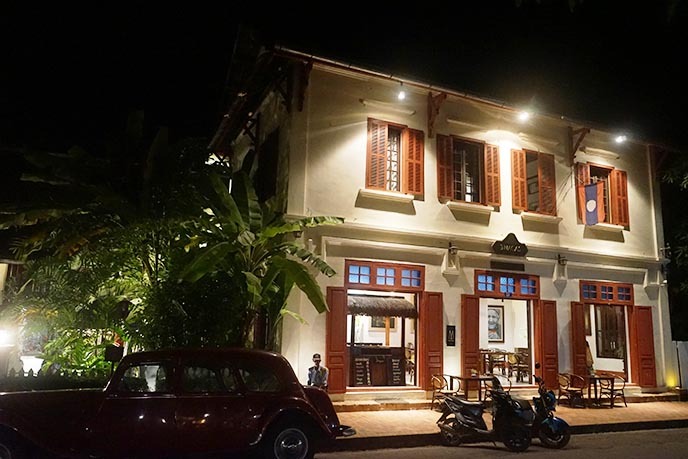 Sofitel Hotel Luang Prabang was once a century-old colonial mansion. It was transformed into a resort in 2010, but retains the elegant manicured gardens and amethyst tiles. One evening, we ate dinner at Governor’s Grill. 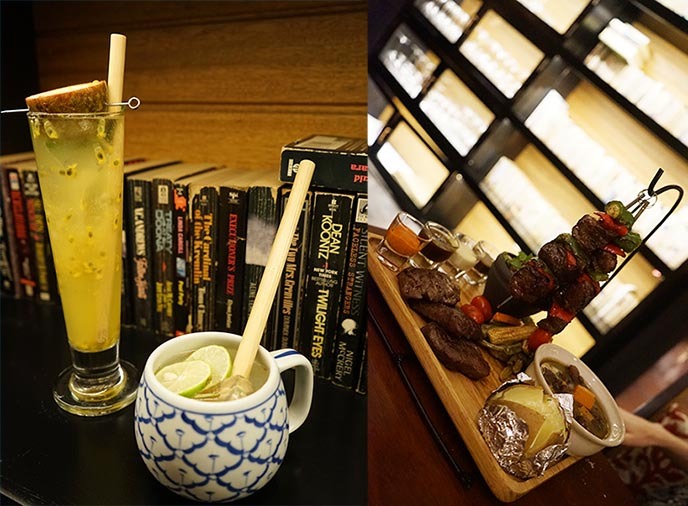 The hotel’s steakhouse brings traditional Lao spices and flavors together with Western specialties. 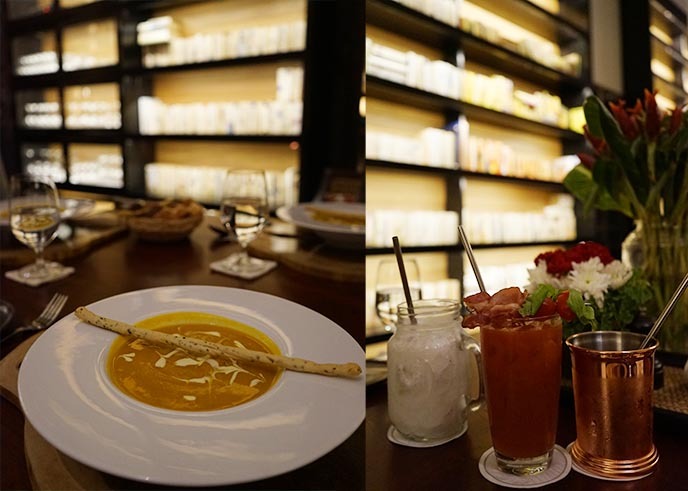 The cocktails, made with coconut and fresh fruit, were the perfect start — along with creamy pumpkin ginger soup. Then came this impressive buffalo tasting platter! The board was piled high with local buffalo prepared in different ways: steaks, kebabs with vegetables, Laotian larb (minced meat salad) and more. 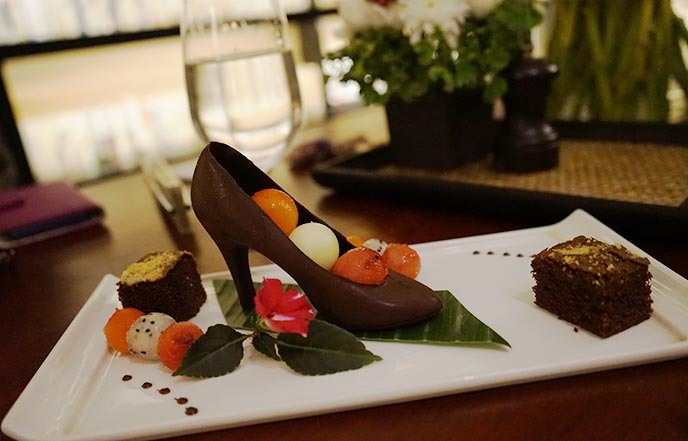 We hardly had room to eat the chocolate shoe with tropical fruits for dessert. 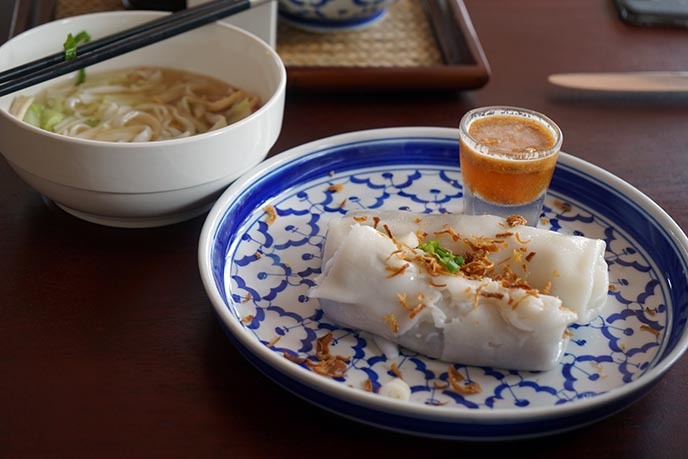 (The hotel also offers a four-course cooking class with the chefs. Guests get to visit a local market and then learn how to prepare authentic Lao fare). 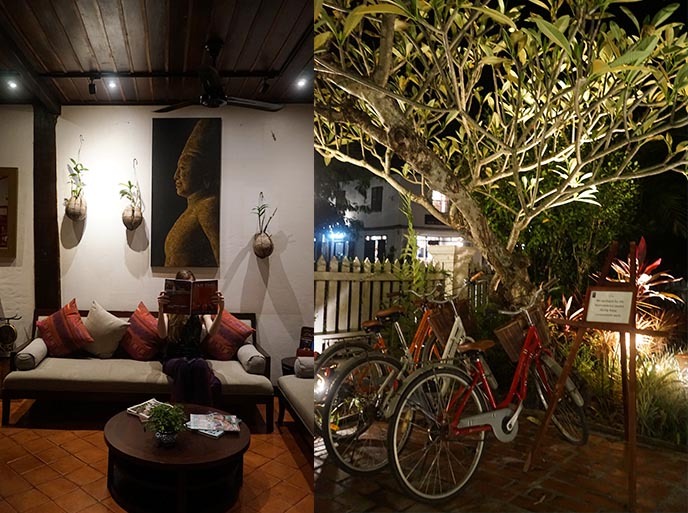 On another night, we checked out their other Luang Prabang property: 3 Nagas, an MGallery by Sofitel hotel. 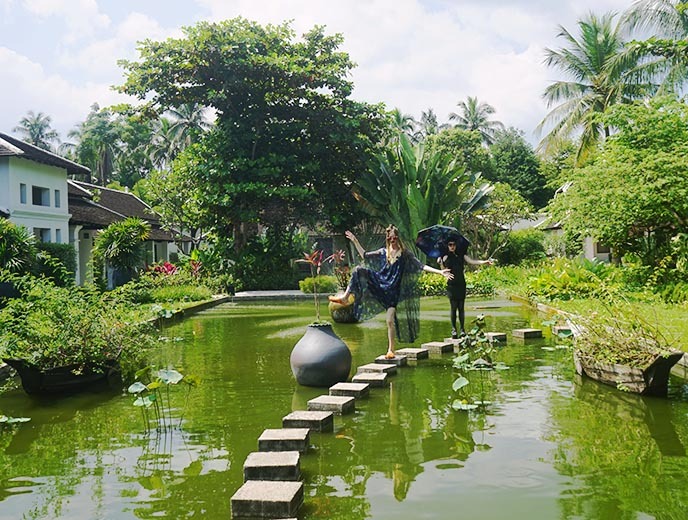 “Naga” refers to a serpent or snake in Sanskrit, and reflects the mythical feeling of these boutique accomodations. 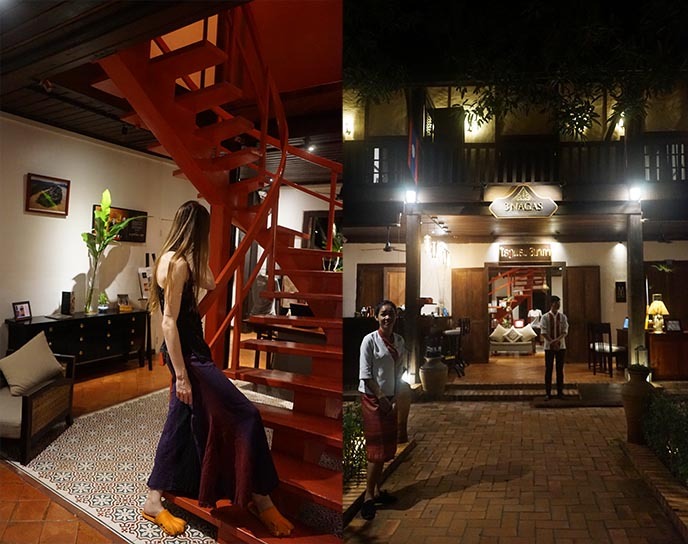 There are 15 rooms in three restored historical houses, blending contemporary style with traditional architecture. The colonial manors are furnished with dark woods, warm throws and spiral staircases. You can either sleep in Lamache House (once an ice cream shop to the royal palace) or Khamboua House (built for the king’s counsellor in 1903). Red decorative accents add to the warmth of 3 Nagas. Guests can stroll in the courtyard garden, and rent one of the matching bicycles. This hotel is right in the city center, so it’s easy to see the Night Market, galleries and temples. 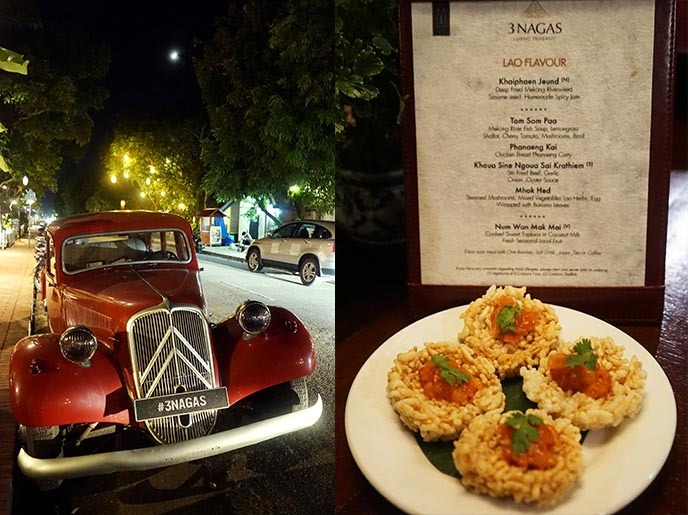 Parked outside, this vintage red automobile hints at the classic food served at 3 Nagas Restaurant and Bar. 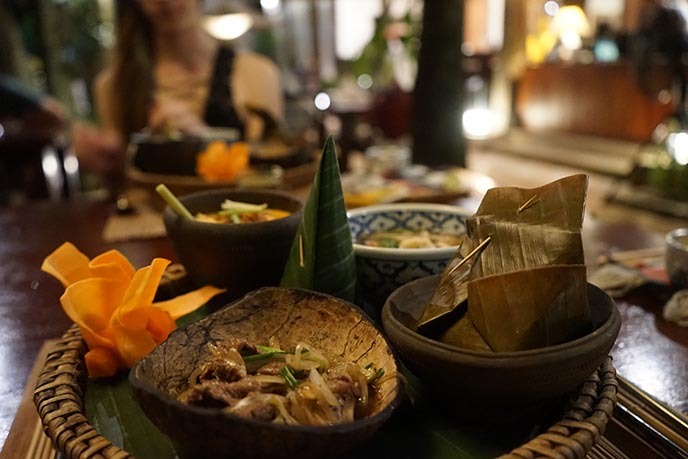 Try the tasting menu, which gives you a broad selection of Laotian favorites. After a rice cake amuse bouche, we ate up this deep fried Mekong river weed, served with sesame seeds and homemade jam. Then came this generous platter with a variety of local dishes, paired with the famous sticky rice. 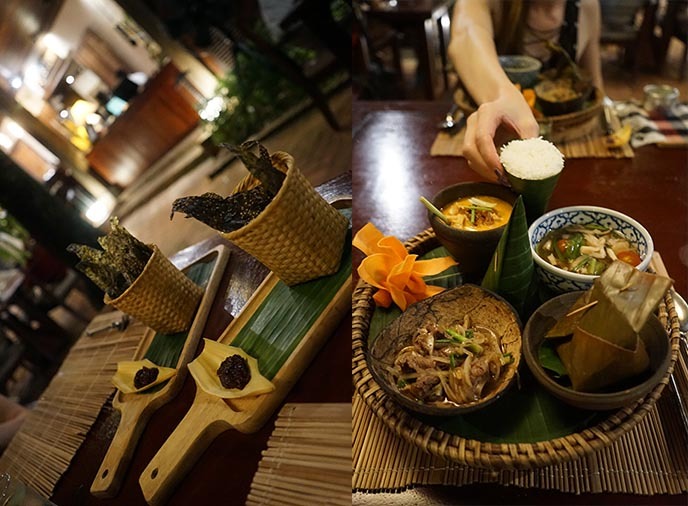 I spy Tom Son Pla (Mekong river fish soup with lemongrass and vegetables), Phanaeng chicken curry, stir fried beef, and steamed egg with mushrooms and herbs wrapped in banana leaves. We were surprised at how much we loved the cone of sticky rice, which is not sweet and goes perfectly. We couldn’t resist getting dessert from the old-time parlor. Coconut, mango and roselle ice cream.. plus custom passionfruit ginger cocktails. A meal to remember. Khop tchaï laï laï (thank you very much) to the kind Sofitel staff for welcoming us! 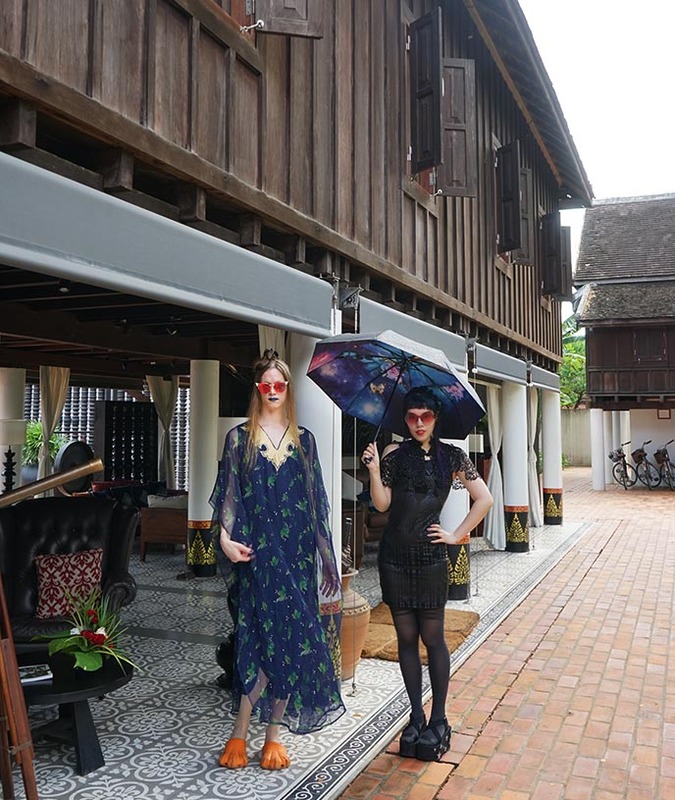 We’re so happy we stayed at this elegant hotel, known as one of the most luxurious in Laos. 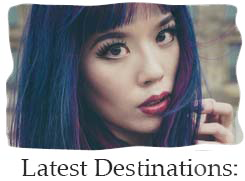 I hope you’ll get a chance to visit as well. 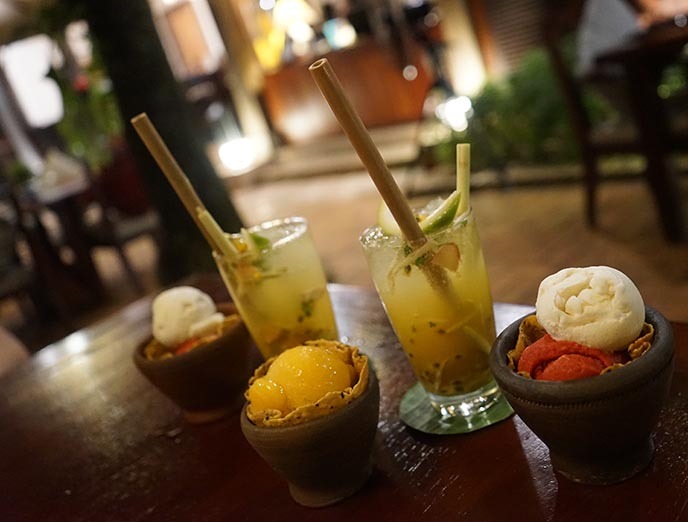 You can learn more on Sofitel Luang Prabang’s Facebook page and Instagram @SofitelLuangPrabang. 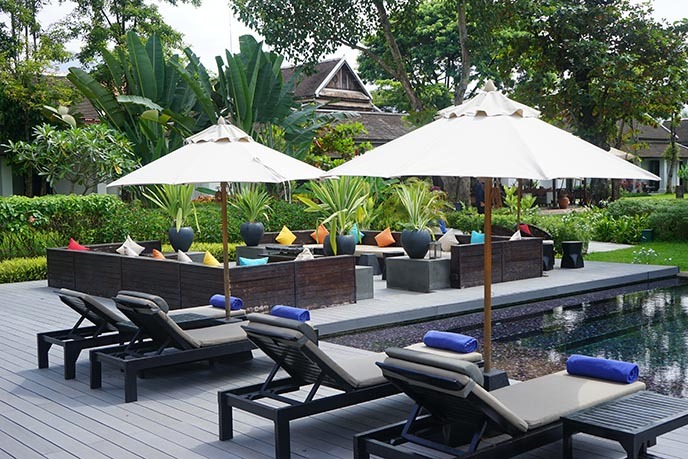 Isn’t the Sofitel Luang Prabang straight out a dream? Until next time, Laos. So much fun! Love the food and the weather and the relaxing atmosphere. Just what we needed. Highly recommended!